When we think about ancient mathematics, the Ancient Greeks spring to mind as the founders of the calculations we use everyday. The work of the great Ancient Greek mathematicians pervades every part of life, from sending rockets into space to accounting, and from architecture to DIY. The Greek deductive approach to mathematics is probably the greatest legacy that they passed onto the world, and is one of the foundations of modern society. Even the great theoretical physicists such as Stephen Hawking are steeped in the work of the Greeks, as the foundation of their elegant theories about how the universe works. Mathematicians such as Pythagoras, Euclid, and Archimedes are still familiar to us, over two millennia later, and their work is still taught in schools and colleges around the world. The Greeks took a lot of their methodology and techniques from the Babylonians and Egyptians, as even Plato was happy to admit, but the Greeks were the first to move math into the realm of theory, reasoning and deduction rather than measurement. The Egyptians tended to use mathematics for practical purposes and used brute force to solve problems; for example, they were not bothered about finding an exact number for Pi and, as long as it served their purposes, an approximate value sufficed. The Babylonians looked at the relationships behind numbers a little more than the Egyptians, but even their slightly more abstract work was largely empirical in nature. The Greeks changed this by looking for underlying rules and relationships governing numbers and functions. They believed that, because the universe was perfect, they could use deductive reasoning to establish mathematical facts, without the impurity of inaccurate empirical measurements. This shift in focus fueled the great advances they made in geometry, algebra and calculus, and mathematical reasoning even became the basis of logical arguments. Thales of Miletus earned his place in history as the first of the Greek mathematicians, although he is often unfairly overlooked in favor of Pythagoras, Archimedes and Euclid. Because we have no primary sources describing his contributions, we have to rely upon later mathematicians to fill in the details. Although his contribution was undoubtedly immense, this lack of information prevented him from becoming as influential as Euclid or Pythagoras, whose texts were studied by the great Islamic and Renaissance scholars. 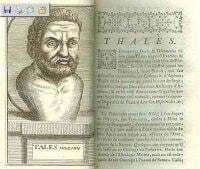 As a student, Thales traveled to Egypt and learned all that he could from the scholars there about trial and error methods for solving mathematical problems and astronomy. He soon began to surpass his teachers and began to question how the numbers fitted together, believing that these trial and error methods lacked elegance and verification. It is rumored, although not substantiated, that he also traveled to Babylon: Even if not, it is likely that the work of the Babylonian mathematicians was available to him. 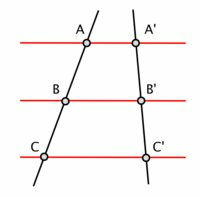 If one side and the two adjacent angles of a triangle are shared by another triangle, the triangles are identical. This all seems instinctively correct to modern students, and we take such axioms for granted. However, this was the first time that a mathematician had tried to lay foundations for a deductive process, and these first principles fueled an explosion in the study of mathematics. 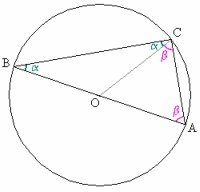 Using these axioms, he deduced that any triangle could be circumscribed with a circle that would touch all three of the apices. In Egypt, he amazed the Pharaoh by measuring the height of a pyramid from the shadow cast by the sun, using proportion. He reasoned that, if the sun cast a shadow from a staff that was equal to the length of the staff, then the shadow cast by the pyramid would also be the same as its height. Thales was the father of Greek mathematics and began the process of deriving theorems from first principles that we still use today. This was only part of his legacy, because he taught many of the mathematicians that would follow him and build upon his theories. One of these was Pythagoras, a name known to countless schoolchildren through his famous theory.